Savvy investors have a plan and stick to it. However, even positive events, such as receiving stock options from an employer, can disrupt their plans. 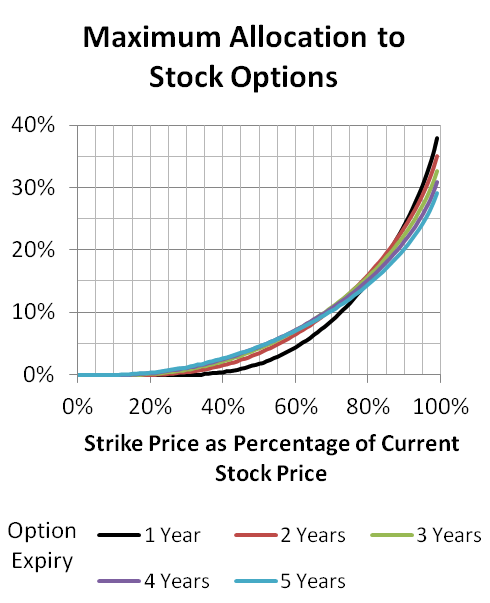 Call options on a single stock are just not a part of most investors’ long-term investing approach. Here I investigate how incentive stock options fit with an index-based investing plan. One simple answer would be to exercise the options (if they are in the money) at the earliest opportunity and sell the received stock. However, there are cases where this clearly makes no sense. For example, if you have 1000 options struck at $10, and the stock trades for $10.10, it makes no sense to cash out for only $100. Given the downside protection the options provide, it makes more sense to hold on. If the stock manages to get to $11, the value of the options increases 10-fold. Another answer is to go on the open market and sell call options on your employer’s stock. On paper, this gives you both the stock value above the strike price plus the time value of the options. However, some incentive option agreements explicitly forbid this, particularly if the options aren’t vested yet. Another potential problem is that incentive option agreements often have clauses that permit the employer to revoke the options under certain circumstances; you could be left losing big money with naked calls. So, I’m going to restrict the choices to either 1) continue to hold the options, or 2) exercise some or all of the options and sell the resulting stock. Under this restriction I will try to answer the question of when it makes financial sense to exercise and sell and when it makes sense to continue holding. 1. The strike price as a percentage of the company stock price. 2. The number of years before the option expires. 3. The value of the options (after exercise and stock sale) as a percentage of your total stock portfolio (including both stock index funds and stock options). 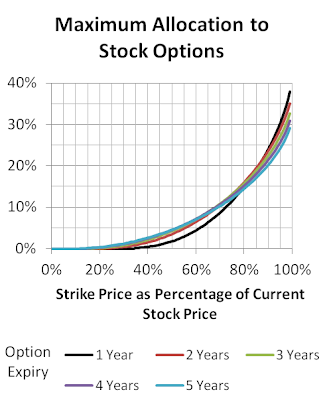 So, given the strike price percentage and remaining years on the option, we want to know the maximum percentage of your portfolio that should be made up of the stock options. To find this, I assumed that we want to maximize the expected compound return on combined stock index funds plus stock options. Let’s take an example to get a feel for what this chart means. Emily has a stock portfolio worth $100,000, including $20,000 in stock options (5000 options struck at $12 on shares that trade for $16). So, the strike price percentage is 75%. Looking this up in the chart, we see that the optimum option portfolio percentage is 12% to 13% depending on how many years are left on the options. If Emily believes the assumptions underlying this analysis, she should exercise about 2000 of her options, sell the resulting stock, and buy more stock index units with the proceeds. Note that if the company shares rise in value, the strike price percentage drops at the same time as the percentage of your stock portfolio made up of options rises. So, in the happy situation where company shares are rising, we are moving left and up on the chart to where the optimum percentage value of options gets lower. This means that the rightmost part of the chart is largely academic. By the time we are considering exercising options, we have moved left along the chart. 1. Stock prices do not exactly follow a nice, tidy normal distribution; in the real world, black swan events are more likely than this. 2. Most people want to be more conservative than a strategy that maximizes expected compound returns. 3. You depend on your employer for your income, which creates a single point of failure to wipe out both your stock options and your income. 4. A given employer’s stock may be more or less volatile than the average individual stock. The kinds of companies that give out stock options to many of their employees tend to have more volatile share prices than average. I’ve seen this way of thinking cause many people to hold onto valuable options until the stock drops to the point where the options are worthless. Optimism is good when you’re working hard at your business, but not when you’re investing your money. We tend to be most optimistic about our company’s prospects when its stock price is rising. But this is exactly the time when the chart will tell us to exercise some options and sell the resulting stock. This is very hard to do when we’re optimistic that the stock will go even higher. Nobody should blindly follow a chart like this. But without this chart, I really had little idea when I should exercise company stock options. My main takeaway is that the optimum percentage of my portfolio in company stock options is lower than I realized. I suspect that in most cases, people should be even more conservative than the chart suggests. However, it is likely that people will continue to take wild chances with their portfolios when they have valuable employee stock options. Blue Hedge Investments are shaking things up in the Canadian investment landscape. I've had a few people express concern that I've either lost my mind or have sold out to scam artists. Click on "INVEST NOW!" to see what this is about. Larry Swedroe reports that hedge funds had another lousy year. The Blunt Bean Counter warns that new rules could lead to punitive taxes for incorporated contractors who are declared “incorporated employees” by CRA. Potato has some interesting thoughts on the debate about whether to prepare for financial emergencies with cash savings or a line of credit. He believes that it makes more sense to invest extra cash above one month of emergency savings. I think this depends on your situation in life. As many experienced tech workers with high-paying jobs found out a decade ago, your job can disappear and it can take years to find a new one at just 75% of your previous pay at the same time that your stock investments tank badly. I agree that emergency preparedness should be a combination of cash and a line of credit, but the appropriate cash amount can be very different from one person to the next. My cash buffer varies, but it is rarely under $20,000. When I was in my twenties, I considered a cash buffer of $1000 to be quite a lot. Retire Happy Blog makes the case for low cost passive investing based on 20 years of experience in the investment industry. Preet Banerjee reports that higher commodity prices are driving up food prices and we’ll see higher restaurant prices as well. Big Cajun Man is trying to coordinate the federal government and his bank to sort out his pension and RRSP savings. He’s only been at it for a couple of years, so he’s probably got a while to go yet before things settle down. My Own Advisor reports on the austerity measures planned for Greece including a 20% public-sector wage cut. This is some painful fallout from ignoring growing public debt. Million Dollar Journey answers some investing questions from a new grad just entering the job market. Rob Carrick says it’s time to lock in your natural gas price. He reasons that current prices are very low compared to previous highs. Buying a fixed-price contract for natural gas is like buying insurance against price increases, but for natural gas this insurance is quite expensive. Carrick says that the current gas supply charge he pays is 12 cents per cubic meter. (He also points out that at this low price, the supply charge is only about half of what you pay. The other half is storage and distribution costs.) The peak price was 42 cents per cubic meter. The cheapest price he could find to lock in for the next 5 years is 19.7 cents. To make these figures more real, let’s use my family’s consumption numbers. We used 4700 cubic meters of natural gas over the last year. This translates to a cost at current rates of $564 per year (plus roughly another $564 for storage and distribution). At the peak price, this would be $1974 (plus $564). At the best 5-year locked in rate, this would be $926 (plus $564) per year. If natural gas stayed at 12 cents, the added cost of the fixed contract is $362 per year for a total of $1810 over 5 years. On the other hand, if rates were to suddenly shoot to 42 cents and stay there for 5 years, the fixed-price contract would save $5240 over 5 years. So, for an insurance premium of $1810, I could buy protection from big jumps in natural gas prices. The difficult question to answer is whether this is a good investment. Are big price increases likely? If yes, then why are the suppliers dumb enough to supply gas at 12 cents right now? And why are fixed-rate suppliers willing to lock in 19.7 cents for 5 years? My guess is that like other forms of insurance, this is not a good deal strictly based on the expected outcome. After all, gas prices would have to rise steadily at 20.2% per year for 5 years for you to break even on this insurance. The real value of insurance is protection from big losses. I buy liability insurance for my car because I don’t want to pay a million dollars if I’m at fault in a serious accident. In the case of natural gas, even in an extreme scenario where gas prices shoot up to 42 cents, it would cost me an extra $1410 per year for 5 years. I can handle this. I wouldn’t like it, but it wouldn’t devastate me. So, I won’t be buying a fixed price natural gas contract. While it is possible that I’ll lose out by just paying market rates, I believe that the expected outcome is in my favour, and the worst case isn’t all that bad. David Trahair’s book Crushing Debt is subtitled Why Canadians Should Drop Everything and Pay Off Debt. This led me to believe that the primary focus of the book would be the need for individuals to reduce their debts. However, to get to discussions of personal finance and debt reduction, readers have to wade through the first half of the book which is about macroeconomic factors related to debt. The book has some interesting parts, but overall it is a little thin on useful content. Trahair says that in some cases, those who “brag about never carrying a credit card balance” are actually “using a line of credit to pay off [their] credit card[s].” With large line of credit balances, these people may be in worse shape that those with a small credit card balance and no line of credit. One of the better parts of the book was the explanation of why the goal of being debt-free is important. “In a severe recession, everything bogs down. Stock markets tank and ... real estate will plummet too.” Your creditors will try “to collect the money owed to them like starving dogs looking for a bone. You don’t want to be the subject of their hunt do you?” The message here is that you should not be evaluating the riskiness of debt in typical economic conditions, but rather in unfavourable conditions like a recession or when interest rates shoot up. Trahair served 6 years on the Board of Directors of Credit Canada. This translates into quite a good section on the three choices for help getting out of personal debt: Credit Counseling Debt Management Plan, Consumer Proposal, and Bankruptcy. The strengths of this section are helping you decide what route to take and what to expect from each choice. I would like to have heard more about potential pitfalls. I’ve heard stories about unscrupulous credit counselors, but I don’t know the typical ways that the bad ones exploit their clients. “The vast majority of Canadians ... have no idea where their money is going.” I think most people would get some surprises if they saw a pie chart of how much they spend in various categories. Trahair gives some very detailed instructions on how to collect your transactions from your bank’s web site and compile them in a spreadsheet. Even novice spreadsheet users would have a chance at following his directions. Canadian Couch Potato looks at our tendency to overvalue the things we own. This can actually makes sense in some contexts. For example, it makes sense to give a low value to a new type of laptop bag until you’ve used it for a while and discover it’s much better than your old kind. But this doesn’t apply to investing; you don’t have to own something to judge whether or not it’s a good investment. Big Cajun Man is unimpressed by Suze Orman’s new debit card. The Blunt Bean Counter raised $12,575 in his bloggers for charity drive. Preet Banerjee explains why owning real estate may not be the best idea right now. Canadian Capitalist compares currency-hedged vs. unhedged holdings. Million Dollar Journey explains Health Spending Accounts and their tax benefits. You’ve logged in to pay your credit card bill and you have to choose the date to transfer the money. Do you choose the actual due date, the day before, or some earlier date? What is the right balance between the risk of late fees and the opportunity cost of paying early? Some people say they always pay bills on their due date and have never had a problem with late fees. Others claim that banks use dirty tricks like setting due dates on weekends and holidays and not recognizing payments until the following business day. It can be difficult to gauge the risks of paying on or very close to a due date. But it isn’t too hard to figure out the cost of getting caught paying late if you can’t talk the bank or other creditor into waiving the late penalty. Many utility bills actually say explicitly what the cost will be if you pay late. With credit cards, the cost is retroactive interest back to the date of purchase on all outstanding items. The total penalties are often in the 2% to 3% range. The opportunity cost of paying bills early depends on what else you would have done with extra money. It would not be a fair comparison to say that you are just losing bank account interest, unless you really just have all your savings in a bank account. If you had more money in your bank account, you’d probably use the excess for some other purpose such as paying down debt or investing for retirement. I’ll use 8% per year as an opportunity cost on the assumption that this is a reasonable return expectation for retirement savings and that you’ll find some way to avoid paying higher than 8% interest on any debts. On a $1000 bill, cost of paying late is about $20 to $30, and the opportunity cost of paying early is about ($1000 * 8% / 365) = 22 cents per day. In my household we tend to pay bills at least 2 days early, but occasionally as long as 2 weeks early for an average of about 3 days. On a yearly total of about $40,000 in bills, the total opportunity cost works out to $26 per year. So, if this policy of paying early prevents just one instance of paying a $1000 bill late during the year, we’ve broken even. I’m no fan of giving money to banks needlessly, but I do like not worrying about whether our payments are made on time. The top bid in the Bloggers for Charity initiative was Glenn Cooke at InsureCan Inc. He donated $100 to the Wilmot Family Resource Centre that provides affordable social, educational, and recreational services and programs. What would you think if your car insurance broker suggested that you pay higher premiums for your car insurance in order to build up your RRSPs? You’d probably think that something was funny, and go looking for a real expert for your RRSPs. Conversely is your investment advisor the first person you call for advice on the best car insurance rates? Both of those situations smell a bit funny. Yet swap out the words ‘car insurance’ for ‘life insurance’ and all of a sudden many consumers find the idea more palatable. Why is that? The answer lies with a bit of history and a bit of insurance product design. Car insurance premiums are priced on a year by year basis – risk is passed along in the form of premiums each year. For most life insurance products, though, premiums are levelled out across a number of years, sometimes even out to the entire lifetime of the insured. This levelling process means insurance companies build up a reserve of premiums inside the policy over time. That reserve is intended to cover some of the higher risk on life insurance as the insured gets older. The insurance industry, however, has taken that reserve and marketed it through the years as a saving plan or investment. And that has given us an environment where life insurance specialists are dabbling in different investments. Hypothesis #1: You can find better investment options outside of the life insurance industry. The standard sales technique goes like this: If I show you that you could invest in a product where the growth was tax deferred, wouldn’t this increase your investments substantially? Of course it would – when compared to an investment that isn’t tax sheltered. What got missed was that most Canadians have a variety of other tax sheltered investment options available to them. RRSPs are always a better option than investing in a life insurance policy, and how many Canadians have maximized their RRSPs? Few have. Now some in the insurance industry will tell us that insurance investments become worthy after you’ve maximized your RRSPs. At that point, the tax sheltering seems to become comparable to other types of non-insurance investments. Unfortunately (for the life insurance industry) while the tax sheltering may be comparable, the investment options are not. Life insurance investments typically have hidden surprises like heavy back-end loads and high MERs. These two things mean your money is likely to be locked in place and provide you with a lower return than similar options available outside the life insurance industry. It’s worth noting that there is a big push from inside both the insurance and investment industries (and the banks) to capture all of your business. There are a lot of benefits to the industry for you to deal with one place for both your insurance and investments – benefits that are not necessarily in your favour. Corollary #1: Don’t use your insurance advisor for investments. Insurance agents and brokers are licensed to sell insurance – we are not licensed to sell investments. The big world of investments, the billions (well, seems like that) of mutual funds available, are simply not available through your insurance advisor. So you are going to get an insurance product first and foremost, not a product that is primarily intended to be an investment. Secondly, you’ve now purchased an insurance product that’s been repurposed for investments. What does that do to your insurance? Do you now have the proper insurance product? Or did you have to bend on the insurance in order to get the ‘right’ investment? Corollary #2: Don’t use your investment advisor for insurance. Some advisors are dual licensed – they are able to offer both investments and insurance. It seems like we have the best of both worlds. But do we? I’d like to suggest that both the investment and insurance environments are so vast and complex that it’s virtually impossible for one person to be expert at both of them. In the field of insurance we have our own compliance regime, product changes, risk management, riders, ratings, product idiosyncrasies, and a slew of other minute details that can consume an advisor’s entire career just keeping abreast of them all. What’s the best company for someone who quit smoking six months ago? What’s the best company for someone with diabetes? Or for a pilot? Or for someone with 4 children? If an investment advisor is staying on top of the investment environment, how can they possibly also have the time to stay on top of the complex insurance environment as well? If you do want to stay with one firm for loyalty reasons, some larger firms have both investment and insurance reps that will refer business between each other. This allows you to get the best of both worlds while sticking with one company. In summary, if you’re using an advisor for investments, find yourself an expert on investments and stick to investments. If you’re looking for life insurance, find yourself an expert life insurance advisor and center the conversation around insurance. Use two different people for these services. Too late? Have you already intermingled these two products? While the life insurance industry has traditionally trained its reps to never replace a life insurance policy, I’ve provided some strategies over at Financial Highway on How To Replace a Life Insurance Policy. Glenn Cooke is a life insurance broker and president of InsureCan Inc. He is happy to provide a second opinion on your life insurance options and does not offer investment advice to his clients. He can be reached at (866) 662-5433. We often hear that while most investors are better off with passive investing in index funds and ETFs, skilled investors should try to beat the market. The problem here is that the word “skill” here has a technical meaning that is quite different from its everyday use. The technical meaning of investing skill is more or less synonymous with having better than 50/50 odds of beating the market. So, if the odds are that you’ll beat the market (after costs), then it makes sense to try. But this meaning is very different from the ordinary use of the word “skill”. Let’s break that sentence down starting from the end and working back. Why should you compare your skills to only other active investors rather than everyone? When you are an active investor you can only succeed when you take money away from someone else. You can’t take money away from people with nothing to invest or who are passive investors. You can only succeed when other active investors fail. If you’re not better than your competitors, then you will lose. Why should you dollar-weight the active investors you compete with? If some investor is only playing with $500, even if you out-trade him for his entire portfolio, you’ve only made $500 (less costs). When you make a trade, the person on the other side of the trade is much more likely to be someone controlling a huge portfolio than a small one. Your main competition is big players, not other individual investors. Why do you have to be ‘significantly’ more skilled? Active investing generally has much higher costs than passive investing. Active traders as a whole pay more in commissions, spreads, and taxes (for non-registered accounts) than passive investors pay. If you achieve average results among active investors, then you’ll still get lower returns than passive investors. You have to clearly beat the (dollar-weighted) average active investor. Getting back to the technical meaning of investing “skill”, it may be that skilled investors exist. Warren Buffett demonstrated skill over his investing lifetime. Some argue that modern efficient information flow and the increasing number of talented people who analyze markets has made it harder to be a skilled investor. If skill still exists, it must be rare. The next time someone talks about investing skill, keep in mind that this means much more than just being smarter than your brother-in-law. Recently, a car ad trumpeting 0% financing caught my eye. Sounds great! I’ll take it. Just give me a 25-year amortization at 0% and I’ll drive off in my new car. Fat chance. The car company would never agree to this arrangement because the financing isn’t really at 0%. If I could get this deal for a $30,000 car, the payments would be $100 per month for 25 years. At 4% inflation, the last payment would have the purchasing power of $38 in today’s dollars. That would be a very sweet deal, especially if $30,000 was the final price after negotiation rather than the inflated asking price. In reality, we get to choose either a price discount (cash back) or a low financing rate for just a few years. This proves that the real financing rate is much higher than advertised. No doubt car marketers know how to avoid breaking the law, but why is this type of advertising permitted? This reminds me of the deal my parents were offered when they bought their first house. They could get the house for one price, but if they paid a few thousand more, they would get a free car as well. This is a curious use of the word “free”. Even for people who understand that the financing rate is really much higher than stated, the effect of these games is to confuse the consumer. One way to sort things out somewhat is to check what loan terms you can get from a bank to compare them to the car company’s financing terms. Take the car’s price (after negotiating it as low as you can) less the cash back and talk to your bank about what the payments would be. Compare this to the car company’s payments (for the same number of years of payments). This will give you an idea of how the car company’s real financing rate compares to the bank’s rate. Preet Banerjee answers some questions from a financial advisor not happy with his Globe and Mail column, Would you give up 44 per cent of your investment over 25 years. Larry MacDonald asks several experienced investors how they handle portfolio rebalancing. Larry Swedroe shows that when it comes to investing, what you don’t understand can be very expensive. Canadian Couch Potato explains how ETF units come into and out of existence and how this process keeps them trading at the value of the underlying assets. Potato analyzes his performance as an active investor and explains his struggle to decide whether to be an active or passive investor. The Blunt Bean Counter explains 5 popular CRA audit targets. Big Cajun Man writes about the magic dancing monkeys that may be standing (dancing?) between him and his son’s Canada Learning Bond. Canadian Capitalist summarizes the 2011 returns for various asset classes. Gail Vaz-Oxlade explains that the best way to change your behaviour is to focus on what you really, really want rather than focusing on what you should stop doing (in a post no longer online). I see the power of this with one friend of mine who has set a target date to retire into a life of daily golf. He is laser-focused on his goal and this makes it easier for him to save a high percentage of his income. Without this goal it would he harder to avoid expensive temptations. Million Dollar Journey and Money Smarts announce their results in a 2011 stock-picking contest. The average result of the 9 participants was a loss of 14.57%. My pick of the Canadian and US stock indexes would have been well above average. Adding my real money portfolio as a participant in the contest would have left me fourth place out of 10. So far I have more questions than answers about the new Pooled Registered Pension Plans (PRPPs) and a big question is what the costs will be like for participants. The Department of Finance has a framework document that lays out the basic idea of PRPPs, but it is the details that will determine if this approach is beneficial for Canadians or not. PRPPs will be administered by “regulated financial institutions that are capable of taking on a fiduciary role in order to act in the best interests of plan members.” The investment choices will allow participants to create portfolios consistent with their “investment objectives and risk preferences including a low cost option.” This seems to imply that high-cost options may be offered as well. Because it will be employers who will decide which financial institution to choose as a PRPP administrator, and we can reasonably believe that employers can evaluate costs better than the typical Canadian, there is some hope that PRPP administrators will compete on costs, but this is not guaranteed. If the PRPP legislation doesn’t prevent administrators from “refunding” part of the investing costs back to employers, then competition on costs could be undermined. (See the update below that explains why this is not permitted.) If one administrator’s costs are 0.5% of plan assets and a second administrator’s are 1.5% with a 0.5% “refund” back to the employer, which one do you think the employer will choose? Note that both the administrator and the employer are better off with the second plan as long as employees don’t revolt. I have (had) no idea whether the PRPP legislation or the required fiduciary role of administrators is likely to prevent such a scheme to give incentive payments to employers. However, if PRPPs take off, there will be huge amounts of money at stake. I’d be interested to hear from anyone with an expert opinion on whether any type of direct or indirect “refund” scheme is likely to be possible with PRPPs. "24. Subject to the regulations, an administrator must not give, offer or agree to give or offer to an employer an inducement to enter into a contract with the administrator in respect of a pooled registered pension plan." Canadian Couch Potato recently posted a thoughtful criticism of Gordon Pape’s argument in favour of active investing. Pape’s reasoning strikes me as another example of what I call the ‘Hail Mary’ argument. Passive index investors receive market returns less modest costs. Active investors also receive market returns, but their costs are much higher. So, on average, active investors get lower returns than passive investors. This is true whether market returns are high or low. Despite this argument, which is based on simple math, we often hear people say that when the markets give poor returns, you have to become a stock picker to get decent returns. On the surface this is true. The only way to beat the market is with some active investing approach; passive investors will never beat the market. However, the average active investor will still lose to the market. A few will beat the market, and most will get less than market returns, even when market returns are poor. For most investors, trying to beat the market is a Hail Mary approach. It probably won’t work, but passive investing is guaranteed to not beat the market. So, what’s wrong with a Hail Mary? Football teams try them all the time. They’re exciting and occasionally they work. Unfortunately, there is a big difference between football and life. Football teams only try a Hail Mary when it’s the last hope before all is lost. There is no difference between losing with a conservative play and losing with a failed Hail Mary. But, in real life, there is an important difference between getting a cumulative passive return over a decade of 25% and getting an active return of 0%. The only way it makes sense to use active investing is when there is a reasonable expectation of outperforming passive investing. The investor has to be correct in his belief that he is so much better than other active investors that he will overcome higher investing costs to beat the market. Just hoping to outperform by luck is little better than gambling at the roulette table. I do my best to explain things as clearly and simply as possible, but David Chilton, author of The Wealthy Barber Returns, does a better job. Years of seeking financial strategies that work and explaining them to people has clearly paid off. It’s nearly impossible to write a financial book aimed at a broad audience that is useful, understandable, and entertaining, but Chilton has done it. Banks usually determine how much debt you can afford based on your gross income. Chilton advises using your income after taxes and after proper savings. When lending you money, banks don’t care if the interest payments keep you from saving in your RRSP or RESP. “CPP, QPP and OAS may become stingier. If you can survive without them, you just might have to.” This seems to imply that Chilton believes that these benefits may be clawed back (or clawed back more in the case of OAS) from higher-income earners in the future. “Spend more on experiences and less on stuff.” I whole-heartedly agree. On reverse mortgages, Chilton thinks they are expensive (fees and high interest rates), but that they “are, on occasion, a viable solution.” I don’t know a lot about reverse mortgages, but I’ve heard proponents say that your debt can never exceed the value of your home and you can’t be forced out no matter how long you live. This makes me nervous because old people are often forced out of their homes for health reasons. If the debt grows to consume the house, then a forced-out senior would have nothing left to pay for another place to live. I would have liked to read Chilton’s take on this issue. The author is no fan of people using index ETFs to “time the market or play the hot sector.” These people aren’t “just sitting back, they’re making things happen. Things like commissions, higher taxes and below-average returns, for example.” That line cracked me up. Predicting which investments will outperform in the future is very difficult. “I’ve met a phenomenal number of people, however, who can pick past outperformers with uncanny accuracy.” When he meets advisors who think they can pick future outperformers, Chilton likes to ask them “Do you recommend the same funds now that you did three, five and ten years ago?” Of course, the answer is usually no, which means that the previous recommendations didn’t perform well. The frequent humour and wise advice make this book a pleasure to read. The world is full of investing books, but this one also addresses the challenge of saving enough money to make investing worthwhile.